The toga was a wrapped outer garment worn in ancient Rome. Its origin is probably to be found in the tebenna, a semicircular mantle worn by the Etruscans, a people who lived on the Italian peninsula in an area close to that occupied by the Romans. Several Roman kings were Etruscan and many elements of Etruscan culture were taken over by the Romans. The toga may have been one of these elements. The toga was a highly symbolic garment for the Romans. It had numerous forms, but the toga pura or toga virilis was the most significant. In its earliest form the toga pura was a semicircle of white wool. At the time of the Roman Republic (509 B.C.E. to 27 B.C.E.) and after, only free male citizens of Rome who were at least sixteen years of age could wear this toga. 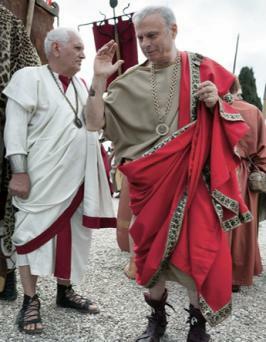 It was the symbol of Roman citizenship and was required dress for official activities. Men wore togas to audiences with the Emperor and to the games played in the Roman arena. The toga was worn outermost, over a tunic. (A tunic was a T-shaped woven garment, similar in form to a long, modern T-shirt.) The toga wrapped around the body. The straight edge was placed at the center of the body, perpendicular to the floor. The bulk of the fabric was carried over the left shoulder, across the back and under the right arm, after which it was draped across the chest and over the left shoulder. By the time of the Roman Empire, the earlier half-circle toga had changed its form and had an extended section added to the semicircle at the straight edge. The system of draping remained the same, however the extended section was first folded down. The overfold section fell at the front of the body and formed a pocketlike pouch, called the sinus, into which the wearer could place objects such as a scroll of paper. As the toga became still more elaborate and larger, the sinus eventually was too open and loose for holding things, so a knot of fabric was pulled up from underneath to form an area called the umbo, and this being smaller and more compact became the "pocket" area. The umbo may also have helped to hold the toga in place. Individuals of some significant status wore special togas. Although both men and women had worn togas in early Roman times, by the time of the Republic only men wore togas. However, a vestige of the earlier practice remained. Sons and daughters of Roman citizens wore the toga praetexta, a toga with a purple border about two or three inches wide. Boys wore this toga until age fourteen to sixteen when they assumed the toga pura, while girls gave up the garment around the age of puberty. Certain priests and magistrates also wore the toga praetexta. 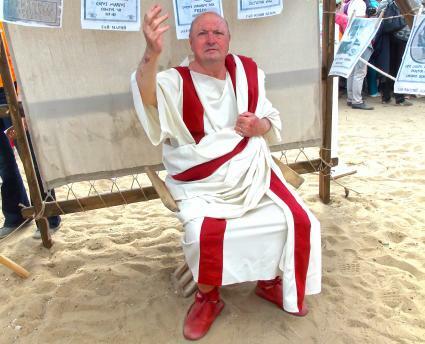 Political candidates wore a toga candida that was bleached very white. The English word "candidate" derives from the name of this garment. A toga picta was purple with gold embroidery. Victorious generals and others who had been singled out for special honors were awarded the opportunity to wear this toga. A toga pulla appears to have been worn for mourning, and was dark or black in color. The toga trabea seems to have been worn by religious augurs or important officials. The toga was an awkward garment. Roman writers speak of the difficulties in keeping the toga properly arranged. Apparently it was acceptable for men to wear longer or shorter togas. A poor man might wear a shorter toga in order to save money, while one seeking to impress others might wear an especially large and long toga. In order to keep this garment clean, it had to be washed often, which caused it to wear out frequently. Replacing a worn toga was an expense that is commented on by some Roman satirists. By the time of the Roman Republic and after, respectable adult women did not wear togas. Prostitutes were said to wear togas, as were women who had been divorced for adultery. The connotation of a woman wearing a toga implied disapproval. The form of the toga continued to change. It seems as if men were constantly searaching for variations that made the toga easier to keep in place. In one version dating from circa 118-119 C.E. and after, the umbo was eliminated by wrapping the section under the right arm at a higher point and twisting that upper section to form a sort of band. This band was called a balteus. In the third century it was an easy step from this to "the toga with the folded bands." In the toga with the folded bands, the twisted balteus became an overfold that was folded and refolded over itself in order to form a flat, layered band of fabric that may have been fastened in place by either pinning or sewing. As the toga wrapped around the body, the bands lay flat, fitting smoothly in a diagonal band across the front of the body. In the latter years of the Roman Empire, discipline in following prescribed forms of dress grew somewhat lax, and men preferred to wear the pallium instead of the toga. The pallium itself was an evolved form of a Greek wrapped garment, the himation, which draped much the same way as the toga. The pallium was a rectangular panel of fabric that, like the toga, ran perpendicular to the floor, around the left shoulder, under the right arm, and across the body, draping over the arm. It was a sort of skeletal form of the toga, retaining its draping but losing its semi-circular form and most of its bulk. Although the toga in its exact Roman form has not been revived in contemporary fashion, the name "toga" is often loosely applied to fashions that feature one covered and one uncovered shoulder. Examples include the "toga dress" defined by Calasibetta (2003) as an "Asymmetric dress or at-home robe styled with one shoulder bare, the other covered" or the "toga nightgown," which could be "styled with one shoulder." Both were styles introduced in the 1960s (Calasibetta 2003). See also Ancient World: History of Dress. Calasibetta, C. M., and P. Tortora. The Fairchild Dictionary of Fashion. New York: Fairchild Publications, 2003. Croom, A. T. Roman Clothing and Fashion. Charleston, S.C.: Tempus Publishing Inc., 2000. Goldman, N. "Reconstructing Roman Clothing." In The World of Roman Costume. Edited by J. L. Sebesta and L. Bonfante, pp. 213-237 Madison: University of Wisconsin Press, 1994. Houston, M. G. Ancient Greek, Roman, and Byzantine Costume. London: Adam and Charles Black, l966. Rudd, N., trans. The Satires of Horace and Persius. Baltimore, Md. : Penguin Books, 1973. Stone, S. "The Toga: From National to Ceremonial Costume." In The World of Roman Costume. Edited by J. L. Sebesta, and L. Bonfante, pp. 13-45. Madison: University of Wisconsin Press, 1994. Tortora, P., and K. Eubank. Survey of Historic Costume. New York: Fairchild Publications, 1998. Wilson, L. M. The Roman Toga. Baltimore, Md. : Johns Hopkins Press, 1924.